Hello, greetings and welcome to the new format of F1 Update!, the venerable (not vulnerable) flagship of The Pond. In the past, F1U! has evolved from a simple e-mail to a light-hearted romp to a much more formal, almost regimented, review of each race. Today, we here at F1U! are going to take it away from that style to a more conversational tone. There are undoubtedly going to be people who won't care for this change, but we're doing it because, to be blunt, it takes too much time to do it the more formal way. When the race is two hours and the F1U! takes four, there's something wrong, and this new style aims to fix it! So let's get to updatin'! *FIRST RACE: The most exciting part of any F1 season isn't the end, but the beginning. Nobody has the faintest idea about which teams are good, which need help, who the surprises are going to be, and perhaps most importantly, how the tires are really going to last. Offseason testing is one thing, practice sessions give you clues, but it isn't until the lights go out, you've got 300 pounds of fuel on board and a Lotus trying to get past you that you know how things are going to work out. When today's race began under cloudy skies but on a dry track, the front-row Red Bulls started exactly the way we expected them to. To whit, polesitter Seb Vettel galloped away and began to gap the field, and second-place Mark Webber had one of his patented Lousy Starts©, dropping from his starting position to seventh in a heartbeat. It looked very much like a repeat of Australia 2011 was in the offing, but once Vettel got out to a two-second lead, it stopped there and began to shrink. Behind him, the Ferraris of Felipe Massa and HWMNBN, followed by the Lotus of Kimi Raikkonen, kept in touch and forced him to run hard. *TIRE WAR: One of the things you can't be sure of during the offseason is how the tires will last. Yes, everybody knows the super-softs won't last as long as the mediums, but they'll be faster, yadda yadda. What's important is exactly how long they'll go, and with the top 10 qualifiers on the super-softs to start the race, it was hardly a theoretical question. Answers came quickly: Vettel pitted on Lap 7, and everybody in the top 10 had stopped by Lap 12... the two Mercedes, coming in last, were coughing up a full second a lap to the fresher medium-shod cars. Once everybody stopped, we had a surprising leader: Force India's Adrian F'n Sutil. He had qualified 12th and thereby got to start on the tires of his choice, the longer-lived mediums. *WAIT, WHAT? 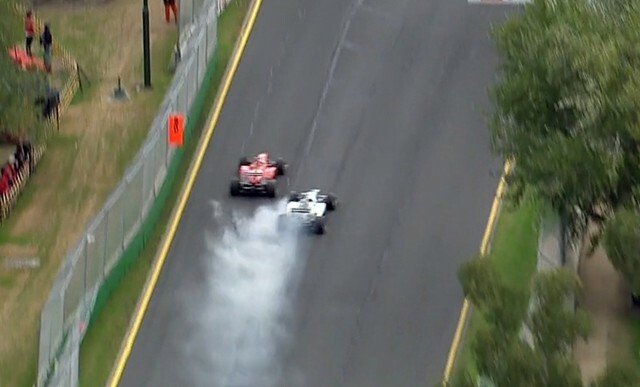 : It quickly became quite obvious that Sutil wasn't a fluke. He made his mediums last some 20 laps, long enough that HWMNBN actually made a (strategic) second stop before Sutil made his first. The race clearly was going to be one of tire maintenance: he who made the fewest stops and could keep pace in worn tires was going to win. Sutil's Force India clearly was gentle on its tires, but the Lotus of Raikkonen was, too... and was a faster car, to boot. It was quickly clear that Force India's strategy was to hope for rain, not a bad plan this weekend, all things being equal. If it came before they had to stop for the mandatory super-soft tires, the team would win their first ever race... and the forecast was changing every minute and from team to team. *AW DRAT: Unfortunately, all of Force India's prayers to Indra went unanswered, and Sutil wound up having to stop for super-soft tires. These proved to be even worse than they had been earlier, giving him two good laps before they went to heck. He wound up falling all the way to 7th, and only a questionable team call kept his teammate, Paul di Resta, from passing him. *UP FRONT: While every eye was turned to the excitement of Sutil's story, Kimi Raikkonen's tire care had put him firmly in front, leading HWMNBN and Vettel. In fact, once the Finn drove past Sutil for the lead, it was clear that the win was going to be his, and that's the way it worked out. In fact, it wasn't even close: Kimi finished 12 seconds ahead of HWMNBN, who was 10 seconds clear of Vettel, who was 11 seconds up on Felipe Massa. *WHAT DID WE LEARN? : Having good pace in practice and qualifying means nothing when it comes to the long distances of the race. Being easy on your tires is better than one-lap pace. And that McLaren is in serious, serious trouble: they finished 9th and 11th, and never once looked good. There's even rumors of them switching back to last year's chassis. *DRIVER OF THE RACE: Adrian F'n Sutil. His first race back after being out of the sport in 2012 turned out to be pretty decent. If a rain shower had come by around lap 35, the race would have been his... and the sky looked like it could have happened at any minute. *TEAM OF THE RACE: Ferrari. HWMNBN's second place is hardly a surprise. Felipe Massa's fourth-place finish at a track he hates probably has to be counted as a surprise. They've got a nice jump on the constructor's championship already. *MOVE OF THE RACE: On Lap 32, Ferrari's HWMNBN was going to pass the Mercedes of Shiv Hamilton. It wasn't a question of "if", but when and that's all there was to it. Didn't mean that Shiv was going to make it easy for the Spaniard, however. When the Ferrari made its move, Hamilton held off on braking for as long as possible... and maybe a little longer. When he did finally step on the clampers, he immediately locked up his front-left tire and had zero ability to steer. HWMNBN, who was past the Merc driver and just about to begin the turn, saw what was going on next to him (though with a smoke trail that long, it'd be hard to miss) and decided that he didn't need to turn right then... it could wait. While this let Hamilton keep the place for a few more seconds, it did keep the Merc out of the Ferrari sidepods. For that quick reaction, HWMNBN gets the Move of the Race. *MOOOOOOO-OOOVE OF THE RACE: A remarkably clean race today, with really only one bit of poor driving. On Lap 25, Papabile Maldonado was heading down to Turn 1 and did what hundreds of drivers had done before him: he moved as far outside as possible to get the best angle into the turn. 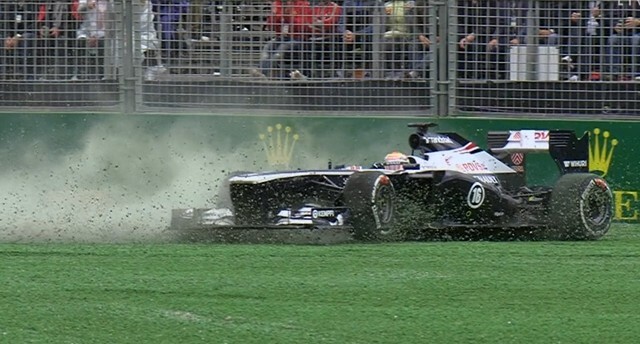 And then the Williams driver went a few inches too far, his left side tires leaving the pavement and hitting the grass. The result was preordained. He was out of the race on the spot, the only car to be eliminated via a method other than technical fault. Here ya go, Maldonado: have a Moooooo-ooove! There's your top 10, and that's it for the first race of the season! Next week, we've got Malaysia, see ya then! Post contains 1339 words, total size 9 kb. 1 Hooray for Force India! Both their cars finished in the points, and that's pretty amazing. 2 AND they had a legit chance to win or podium... if it had just rained. 3 Martin Whitmarsh confirmed that they are considering switching to 2012 car, but for now they'll try and work with what they've got. That probably means another race after Malaysia at the minimum. 4 Never mind, he came out a day later and said they definitely won't switch back to 2012, after apparently an overnight analysis of the race data. 29kb generated in CPU 0.05, elapsed 0.1992 seconds. 47 queries taking 0.1703 seconds, 247 records returned.